1 Sebastien Abbate Love it. Classic Renaissance! 2 Malgosia Alterman Well done. We should react every time we think it's right. Congratulations. 3 Richard Argles Nothing surprises me about anything immoral to do with Russians then and now. I have just had a small bet with a mate that Putin will declare himself President for life in the next 2 years. 4 Barbara Arzymanow I was interested in your letter to The Times. Poland clearly has as strong a case as others who had a similar amount stolen at around the same time. This is certainly a matter that it is right for Polish Heritage to pursue. 5 Alex Baranowski That's great news! 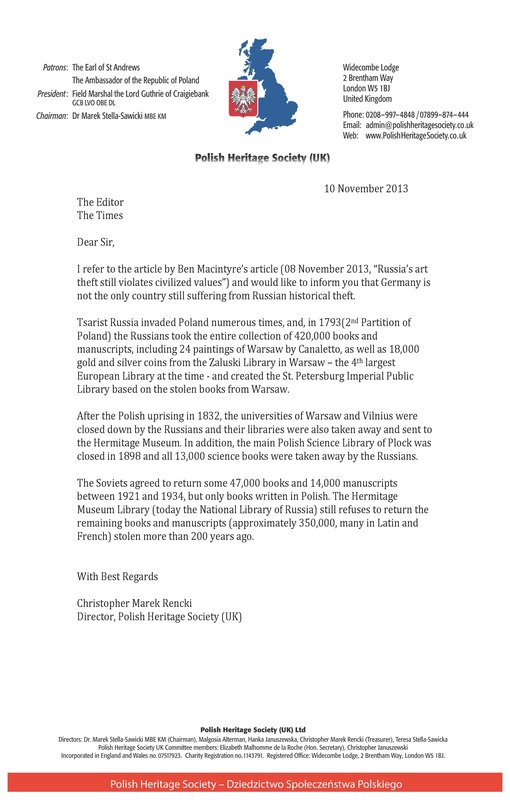 Very interesting to see your email about the Polish / German art thefts. 6 Gaby Baranowska Wow amazing! You must be very proud! 7 Hania Baranowska As far as The Times article…well done for getting it published…and particularly for getting the truth out there! 8 George Barnes Far too often only the European "superpowers" get the attention in these kind of articles. It is thanks to you and others however that similar scandals are publicly recognised to have happened to countries like Poland, which I am sad to say, gets overlooked far too often in case like these ! I for one had no idea that Polish culture and heritage was abused so much under the Russians, and I just hope that you'll be able to recover some more of the stolen art, etc. On the flip side though, I suppose articles like these do raise the interesting point about when (and if) pillaged culture should be returned. If that was the case, then I'm afraid the BM would be rather empty! 9 Katherine Barnes Exellent work and congratulations! A most interesting read for those of us less well versed in Polish history. You should be very proud. 10 Trevor Barnes An excellent epistolary addition to the original article! Well done. 11 Adam Bartkiewicz Congratulations on managing to have the letter published (albeit edited). It is extremely important to confirm for future generations misdeeds done in the past. Russia's (in whatever guise be it Imperial, Soviet, Post-Communist) emnity towards Poland must never be forgotten. The West must be reminded never to be in thrall to the Bear from the East : nothing good ever came from there! (Johannesburg, South Africa) Theft by one country by another is one of the ugly facets of the past. All treasures should be returned subject only to the recipient country having the structure to preserve and protect the items. I recall that there has been debate about treasure removed by both the British - especially from Egypt and Greece - as well as huge treasures removed by the French, particularly during the time of Napoleon. Indeed a large proportion of the treasure held by the British Museum and the Louvre were results of forced removal. 13 Andrzej Bereza Powerful Stuff! You've really added a new dimension to this outrage. Are you alone in highlighting the extent of the Polish perspective? It's a Century of abuse….so what happens next ? 14 Stan Bereza Great that you were able to get your letter published in the Times putting into the public domain the outrageous scale of Russian larceny. I had no idea of the scale of what was lost but Poland was an ancient and (once) rich state. I am surprised that the Polish authorities have not made noisier representations about this. It is always sad to see how little there is in Polish museums today. Is there any more details of what precisely was stolen ? 15 Urszula Bereza Congratulations on getting your letter published, which is no mean feat. I wonder whether there are any legal steps that the Polish Government (or even the Polish Heritage Society) can take to give furtherpublicity to this theft ? 16 Andrzej Blatiak An excellent letter, very well written. Thanks for sending. 17 Wlodek Borzyslawski Interesting article - to get published in The Times must have given you a great deal of satisfaction. 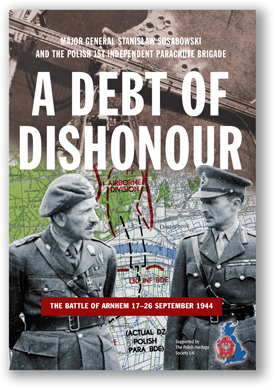 Poor Poland - it has underlined to the British public (that is those who read The Times) that the Poles did have a cultural background and not as Montgomery thought when he spoke to Gen. Maczek that wolves run wild in Warsaw. However it brings to mind what the Brits have in their museums which they "borrowed" from their Empire - when they had one! Indeed the Greeks are still wanting their Marbles back. It is also imperative that the Brits are made aware that we have contributed both in War and in Peace.Hopefully this will be food for another article. Congratulations on getting your letter printed. (Connecticut, USA) I did see your letter and agreed completely with the thesis. It is very unfortunate that the world allows such inequities (and double standards) to exist. You were very thoughtful and persuasive in your articulation : unfortunately, "name and shame" strategies have little effect on such regimes. (Moscow, Russia) I thought it was very interesting. 20 Anastasia Chajecka Thank you for the articles. They are very interesting and surprising. It's shocking to think how many books were taken from Poland for such a long time period - and yet Russia still has them. It is interesting how again the Russians managed to gain ownership of these historical treasures. 21 Krzys Chajecki First, congratulations on getting published in The Times. Your note was clear, concise and highlighted to a large audience the sheer scale of theft of Polish treasures by (Soviet) Russia, something that I had not appreciated. We tend to focus on German misdemeanours and forget Russia was just as bad given the opportunity. Secondly, I thought your note was useful in highlighting the existence of a Polish Heritage Trust, that there is an organisation out there fighting for the cause! Well Done Marek! 22 Maria Chajecka I feel that Poland should appeal to the European Court of Law for the return of these stolen treasures, with a very aggressive and notable lawyer. Also requiring full access to all Germand and Russian museum collections, by Polish experts in order to catalogue the full extent of stolen works. 23 Andrzej Chmaj Yes, I agree, the Russians predating the Soviets, of course, were masters of art theft. You were right to point it out as, like most things Russian which were done to others, this has been forgotten about. 24 George Chmielewski Interesting. A lot of things are owed in various guises by many. 25 Irmina Kocinska-Corder Your article was very informative and interesting. I think most people had no idea that Poland even owned such prestigious paintings! It would have opened a lot of People's eyes! The Poles always seem to be forgotten when it comes to such atrocities! So thank you for opening a lot of people's eyes. You maybe should think about writing a book. 26 Adam Darowski Excellent letter in the Times today. Well done. 27 Antoni Daszewski Congratulations. It is really an excellent letter and well done for championing Polish causes and exposing Russian greed and theft. I must say I learnt a lot from your letter. I did not realise the extent and the scale of the theft. And Russia wants to be considered as part of the civilised world!!! Congratulations once again and please continue to keep up the good work. 28 Monica Chodakowska-Davis Well done, you tell 'em! 29 Kris Dolinski I have read the missives with interest as my knowledge of Polish history did not encompass such detail. The issue that stands out to me from your letter is that the Russians took, but it was the Soviets who returned, albeit only in part. The past cannot be re-written and our expectations of resolution should be tempered with a measure of realism. This in no part takes away from a wish to see artefacts returned to their rightful "ownership". 30 Teresa Folkierska Bravo for speaking out! Most non-Poles have no idea, needless to say, and even among the Polish confraternity these are little known facts. 31 Basia Fuller Yes, I do know of all the atrocities the Russians have committed against Poland over the centuries. I did go to Russia to St. Petersburg and Moscow. I was particularly galled when I went to the Armory in Moscow, seeing all the Russian treasures with many of them marked as "gift from Poland". It will always stick in my crow. I also listened to a lecture by a Russian historian on a river/canal cruise bewailing how the Russian people suffered at the hands of Poles over many centuries and of the many treasures we had stolen! I was gobsmacked, to say the least. 32 William Ganley I was aware of as to the appropriations during the second world war, however, apart from the "trophies of war" previous to that I was unaware of the mass appropriation of Poland's literary/ scientific heritage to which you refer. The Russki's are a law unto themselves and will not return these treasures in the foreseable future, if ever. It will be interesting to see the response to this issue and to your letter. 33 Wojtek Gaworzewski What you are doing is very important and useful in keeping the subject in the forefront of people's minds. Particular congratulations on getting a letter into The Times. (Singapore) Great Letter although I can't add to your particular sum of knowledge as I know nothing about the subject matter. Congratulations on getting your letter published in that eminent newspaper. (Madrid, Spain) I can understand you perfectly how you feel about another nation stealing and destroying your country (we had the Nazis in Spain from 1936 to 1939, ie, Guernica, etc…). I guess you have no sympathy for the Russians…. 36 Basia Kaczmarowska-Hamilton Amazing letter you wrote and congratulations for having it published!! We are the only Nation who knows. Russia well enough. I think we should do all we can to open eyes of the world who really those Russians are. You just did. Well done Marek!! 37 Andrew Hancock Your letter was very timely and an excellent follow up. I typically enjoy the company of the Polish, and nice to see the Russians getting a bit of criticism…having said all that the British are culpable of similar crimes. MP for Chelsea and Fulham Thanks for these - very interesting. 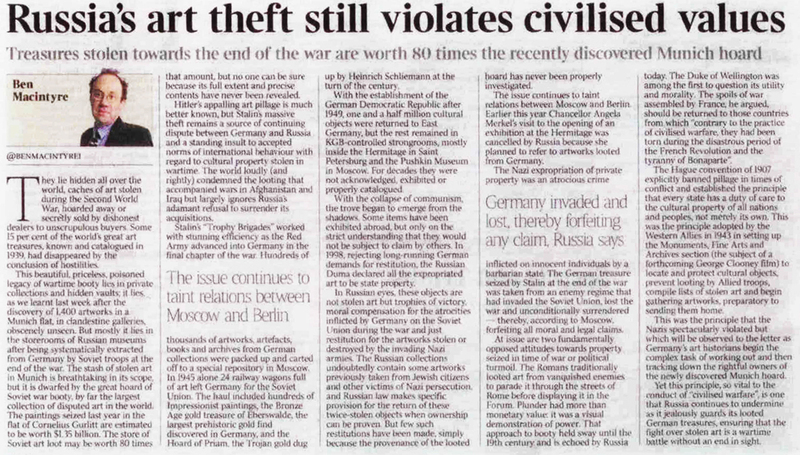 I wasn't aware of Soviet art theft to the same degree as Nazi art theft, so this was quite illuminating. 39 Karol Jonscher I am not too busy to have read your splendid letter to The Times!! Well done, for the subject, the writing style and above all for the success in getting it published (only a tiny proportion of letters submitted make it to print). This sort of thing is very valuable for the Polish cause - remind people who the Russians are, and, of course, what Poland is - its cultural and other heritage. Actually such contributions "in kind" like your letter to The Times, on behalf of the PHS, are just as valuableas raw cash (also most welcome of course) in the overall scheme of things. (Atyrau, Kazakhstan) Yes! I did diligently read both articles. Time and people have forgotten how Poland was pillaged and raped by both sides. Stolen art and moreover destroyed property, historic buildings, everything, there was virtually nothing left. And the main concern is about Germans. Thanks for your contribution. 41 Ola Kinast Your letter certainly highlighted issues from the past which are regularly ignored or omitted. It is indeed important that such matters are brought to light. 42 Beata Kowalski First of all, congratulations on getting your letter printed in The Times, no mean feat! I am delighted you have brought this matter to the attention of a wider audience, who I imagine, believe that only the Nazis plundered works of art and culture. As you say, the Russians (as well as the Germans / Prussians) have been plundering Polish art and literature over the centuries in their attempt to destroy the Polish Nation. Their exploitation reached new heights in 1939, when following the occupation of Poland, the two hostile regimes set about the systematic extermination of the Polish upper classes and intelligentsia, including its culture and traditions. Museums were destroyed and hundreds of thousands of items of historical or artistic value, looted or destroyed. I know that the Polish Underground tried to keep dossiers on the plundered material, which were relayed to the Government in exile, but following the division of Europe post WWII and Poland's placement in the Soviet sphere of influence, obtaining their return, especially from the Soviets, has proved extremely difficult if not futile. I believe that, post 1990, the MSZ (Polish Foreign Ministry) has a dedicated department working for the repatriation of looted property. However, the difficulty seems to be in proving the provenance of artefacts, as inventories of the items stolen were often not made and those catalogues which were available, were themselves either looted or destroyed by the occupying forces. Still, we must seek to mobilise public opinion, much as the Jewish "Project Heart" has done, to persuade the Russians to return their plunder (although I don't hold my breath!) and I commend you and the PHS for giving the matter a high profile. 43 Andrzej Krok-Paszkowski Congratulations on getting your letter published in The Times! What Macintyre doesn't mention are the vast treasures stolen by the Russians from Poland during WWII. I guess this can become very complex - how much of the treasures within Lwow and Wilno really still belong to Poland? This also opens up the can of worms relating to the Elgin Marbles. And closer to home, what about the library and articles bequeathed to the Marian Fathers in Fawley Court, which were without reference to the Polish community in the UK sent to Lichen. 44 Adam Krynski The matter of such narrow vision and one sided reporting is obviously wrong and not acceptable. This historical wrong doing never seems to be raised in any of the major press, not sensational enough. Therefore your action of responding and giving these facts is very important and we fully support it. 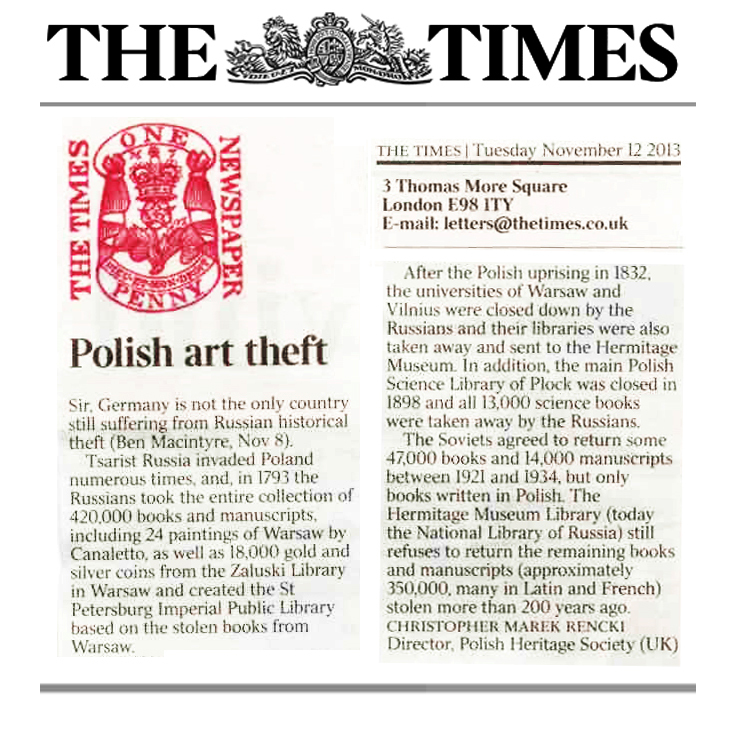 (Deputy Ambassador Polish Embassy, London) I would like to thank you for the time you took to write a letter to The Times on historical theft of Polish arts and books by Tsarist Russia. Your activity is much appreciated as it constitutes a sign of great involvement of the UK citizens of Polish origin in spreading knowledge about Polish history and Poland's historical experience. This involvement contributes to increasing awareness of British Society about issues of importance for the whole Polish community, regardless of their place of residence. Taking this opportuniy, I wish you every success in your future endeavours. 46 Jan Ledochowski In our own family, we know that the original manuscript of our hymn narodowy - " Jeszcze Polska " - was stolen by the Russians from a vault in a bank in Berlin - deposited there by one of our family before the War - and they have refused to return it or indeed help to find it in any way. They also stole stuff just after the Second World War when everyone was pretending Poland was an ally, but was really an occupied country. 47 Stefan Lubomirski de Vaux Regarding your letter to The Times, all I can say, Bravo for raising the issue in public, but sadly a Letter to The times is unlikely to ruffle the feathers of Mr. Putin - but who knows, it may be the butterfly wing beating in South Kensington that causes a storm in Leningrad!! 48 Sue Lupton Gee Whizz, well done. Good homework. Wonder where you will get with this ? (Warsaw) I read the article and was pleasantly surprised. You also raise a very important issue with regard to the lost work of art and the unwilligness of the Russians to recognise a valid claim. 50 Ryszard Makowski Marek, thought your article great, albeit you might mention the German theft of culture & art from Poland. Your reference to the Canaletto exhibition in particular was inspiring. I remember when we had a private viewing of the remaining Canalettos in the Palace of Plac Zygmunta how we were told that the only reason that most of the pictures survived is that the museum curators buried them in the gardens……My word, what upheaval. 51 Mirek Malewski It is good that you have exposed this scandalous international and historical 'misdemeanour'. 52 Ella Kochanska -Malhomme de la Roche Congratulations!! 53 Michael Maslinski Congratulations on your most interesting letter and the fantastic response it has generated. Unfortunately, I suspect the UK authorities will have mixed feelings as they would be very nervous of setting a precedent for the return of "stolen" goods. Anyway, good luck! (Krakow) It was good that you wrote to The Times. A lot of people will not appreciate the extent to which the Russians have plundered from Poland, and it's good you drew attention to this. The number of items you give are, frankly, staggering. Is there an ongoing dialogue with the Russiand about this? If so, tell them that the Brits will hand over the Elgin Marbles to them in exchange. 55 Jim Meechan Typically Russian. …...Is there any ongoing discussion regarding the return of the books and documents ? 56 Joanna Meeson I think your letter to The Times raises important issues about Poland's lost Heritage. Unfortunately, as the Greeks have found when trying to retrieve the Elgin Marbles, I think Poland trying to retrieve lost books and manuscripts might be a very lengthy process, nevertheless a very worthy project. (Warsaw) Thank you for your kind thought in sending the article by Ben Macintyre and your reponse to The Times. We all know that Russia took much Art from Poland and that under the same Soviet regime the Poland Reforma Rolna resulted in most landowners being confiscated and all Art left behind sequested and through today not returned and in most cases not even traceable. Add to that the losses in Warsaw during the uprising in 1944 (again the greater destruction of the City resulting from Russian lack of support with its troops halted in East Warsaw (Praga) and we see a picture of both War propagonists not deserving any sympathy. 58 Wlodek Mier-Jedrzejowicz Thank you for bringing this to my attention, and Well Done! It is worth noting that some of the treasures taken from Germany by Russia at the end of WW2 had been taken by Germany from Poland during WW2. I think it is even possible that the Raphael Portrait of a Young Man, taken from the Czartoryski Museum in Krakow by Hans Frank together with Dama z Lasiczka and never recovered is now in Russia. Again, Well Done and Thank You. This also brings kudos to the PHS. 59 David Mitchell Well said and a fascinating account. What did the Russians do from 1939-45 and beyond into the communist era? Presumably the Russians continue to plunder. 60 Joe Moccia Well done, I had no idea that the Russians too ransacked art galleries. Everyone has kept stum. Now I know. 61 Robert Mortimer I dread to think what the Brits pilfered during their empire days. The V&A, Science Museum, British Museum, etc, would be empty if we had to give it all back. 62 Wiktor Moszczynski I saw the original article about the German works of art plundered by the Russians, but not your letter. It is very much to the point, informative but without unnecessary emotional overkill, just how the British editors like it. Good work. 63 Stefan Mucha From the theft of the great Polish national library collection by the Russians in 1793 to the Second World War and the German invaders, wanton and deliberate destruction of 80% of the Polish national library collection that was recreated in 1928, the looting and destruction of Polish cultural collections have been one of the means that Poland's rapacious neighbours have sought to subjugate Poles throughout their turbulent history. Today Germany and Poland have taken huge strides in reconciling past history leading to the forging of new cultural links between the two, and Marek Rencki's letter in The Times is a poignant reminder that it is long overdue that Russia and Poland should be on the same path of mutual understanding and reconciliation. Russia could enable a giant leap forward in facilitating this process with a meaningful commitment to return to Poland its historic library collection that is some 220 years overdue. (Madrid, Spain) Glad to hear somebody is bothering to claim something back from the Russians (and Germans!!) Good for you!! 65 Andrzej Ostaszewski Congratulations on getting your letter printed. Not an easy achievement. 66 Krysia Ostaszewski Seems very interesting. No doubt the society will try to recover some of the lost heritage ? 67 Adam Ostoja-Ostaszewski Brilliant! But are you now on Putin's hit list, or is he too busy with his new wife ? 68 Stephen Overton Yes, I read both with interest and forwarded to a couple of Polish friends too. 69 Slawek Paleolog Was unaware of the theft until you informed me but naturally fully agree with your article and support it. But what can be done ? 70 Arek Palka Very interesting article. Of course it's an unacceptable behaviour and all stolen books, manuscripts and art collections should be returned. (California, USA) It's great to see that you are setting the record straight! Here in the USA most people don't even know where Poland is! 72 Pawel Pastuszek I very much enjoyed reading your response to The Times: your points are certainly worth making considering that most readers will only be focusing on the thefts that occurred during the Second World War as outlined by Ben Macintyre. Presumably significant and very valuable items of art also made their way from Poland to Germany during this time and are now effectively impounded in Russia? Highlighting the thefts that occurred during the late 18th and 19th centuries is most revealing and very effectively depicted in your succinct letter to the Editor. (Beirut, Lebanon) Love it. I love it when historical facts and truths are thrown out publicly. It is nice to show that journalists at the end of the day are lazy and can't be bothered to do some basic research. 74 Nicholas Plummer Thanks for the mail. I saw the original article last weekend. Well done. We went to the exhibition two years ago at the RA of stolen Russian Art - were these yours ? 75 Irena Pluskowska Thank you for the Times articles. What can I say - except that your late Mother would be very proud of you, not only because you hold such a prestigious position, but because you have all this knoweldge and have the guts to use it. The "Winning" side steals what it can. So it has been everywhere - the world's museums and libraries are littered with the spoils of war. Napoleon himself, so idolised by the Poles who believed all his lies, can be cited as one of the "Modern" examples. This problem with the human race as a whole - a nasty, greedy race of primitive creatures, whose main preoccupation throughout the centuries has been to covet land, power and worship bits of metal - whilst systematically destroying itself over and over again. 76 Krysia Polubinska You certainly have a great deal of detailed knowledge and the itemised theft of books over a period of years - does not surprise me. It's an intrinsic part of the Ruski culture to take and keep, and this will never change. I look forward to reading a comment on your letter from relevant parties. Should be quite enlightening. 77 Jona Poray-Szymanska First of all congratulations for being published. My only concern is that as what you describe is pre-Fourth Geneva Convention whether it was considered a crime at the time. I think looting was very wide spread, look no further than Napoleon. Still, nice to see Polish related articles and comments in The Times. 78 Tadeusz Potworowski It will be interesting to see whether you get a response. 79 Jan Przewozniak Agree completely with what you pointed out. Our cultural losses are always forgotten and it is right to remindan indifferent world. Thank you for writing this letter. 80 Chrissie Radbone Your letter to The Times is great and I hope that it might get back the stolen "loot" from the Russians, I am not going to hold my breath. It is a disgrace that the "so-called" civilised world has turned a blind eye to these, state backed, thefts for far too long, but those vested interests will undoubtedly hold the upper hand. Bet the Polish nation would love to get their stolen Canaletto's back too. You are a true and loyal son of Poland and I hope you get the acknowledgement for this that you deserve. 81 Teresa Rakowska Marek - well done in balancing the argument especially since you hold a responsible position in a cultural organisation. 82 Kasia Robinska I read your letter and much enjoyed it! We have letters that belong to our family (correspondence between Lenin and my grandfather - don't worry he was NO communist!!!) ) and other items that were taken but obviously nothing quite as important. I did not know you were a leading light in Poland's heritage - I am very impressed and admiring! 83 Zofia Robinska-Fielding Anyhow, thank you so much for sending me both the article and your letter. They were fascinating! I had no idea the Russians had stolen so many valuable books and manuscripts from the Poles that they have since hoarded in their own museums. The scale of Russian plundering is terrible, thank you so much for highlighting it. I am sure your effort to keep this topic alive is greatly appreciated by the Polish people. After all, 350,000 books is an enormous amount and they no doubt have many of our valuable manuscripts. I even remember my Mother telling me that my grandfather had once written a letter to Lenin asking for payment. This letter too is stuck in some Russian museum. It does, in fact, beg the question whether the Russians have anything in their museums that they haven't acquired by theft ? On my recent trip to Berlin, I was at the Pergamon Museum and although there is of course controversyover the legitimacy of how the Pergamon Altar ended up in Berlin in the first place, I was interested to read that in 1945, the Russians looted all the loose museum items they could. Only under pressure in 1958 were someof the objects returned to East Germany but a significant amount still remains at the Hermitage Museum. But back to Poland. Well done Marek. I'm sure all Poles hugely appreciate your efforts to have Poland's cultural heritage returned, it will definitively make the museum experience in Poland a more worthwhile one! Onwards with your efforts, we're all behind you. 84 Basia Sabbat Well Done! 85 Jola Sabbat List przeczytalem nawet bezposrednio w gazecie. Bardzo dobrze, ze podjales ten temat. Mysle, ze musimy wykorzystywac wszystkie okazje. (Brisbane, Australia) Your letter to the Times was an absolute revelation to me. Although I knew Poland has been raped and pillaged by the Russians, Prussians and Austrians, I was not aware of the full scale of the Russian theft. With you having quantified it in your letter, I am gob smacked at the size of the theft. Moreover, while Putin reigns over Russia, I cannot foresse the situation changing and regrettably there is no global authority (with any real teeth) which has the power or the means to right this wrong. May be not in our lifetime anyway. Well said Marek and I am so pleased you brought it to the attention of the British public. May I humbly suggest that the only way to achieve higher global traction would be through the media via BBC, 60 Minutes and similar programmes which reach a less enlightened or uneducated generation who need to be made aware. Once again Marek, well done and keep spreading the word. It might eventually get the attention it deserves. 87 Jerzy Scibor-Kaminski Well done, Marek! Just the sort of information to put out about our heritage. 88 Zbyszek Sikora I thought your letter was very good; concise, to the point and factual. But there are issues which you didn't cover (and couldn't because you were writing a letter and not an article). There is no chance Russia will return the stolen art. If the nice British Musem won't return the Elgin Marbles to Greece and the Rosetta Stone to Egypt, then the not so nice Putin won't return his loot. I think there is a strong moral case for the return of art stolen in World War 2 specifically or in living memory generally: in these cases, the victim or his/ her immediate heir is still alive. There is also a legal case for returning recent thefts: the 1907 Hague Convention mentioned in The Times. But with stolen art prior to 1907 there is no legal case. Weaker because the victim is no longer alive and also because art looting was standard practice two or more centuries ago. So while I can't see art stolen more than 200 years agobeing returned to its owners, I think there is case for a "Truth and Reconciliation" approach to such stolen art. The art remains where it is but is put on public display and a description is given as to how the art was acquired. So the Hermitage Museum would have a section "Seized from the Warsaw Library in 1793", for example. The British Museum does this already: a visitor there is no doubt as to how the Elgin Marbles or the Rosetta Stone were acquired. Good luck with your Polish Heritage Work. 89 Penny Sloman Good letter - well done. 90 Marek Skuba Very good article and very much to the point. I am sure this letter is an eye-opener for many. Brawo za "odwage"! 91 Bogdan Staniaszek It is of course great that you have flagged this issue in the national press. I would like to hear if it has resulted in any movement, and also what else I and others could do to support the initiative. 92 Marilyn Stanley Thank you so much for sending it to me. Like everyone else, I had no idea of the comparable Polish art theft and hope that now you have identified the problem so forcefully. Your cause will get more publicity with some similar returns. What you could now do with is a good documentary on TV or even on Channel 4 news. Chrm. Polish Heritage Society Gratuluje! 94 Teresa Stella-Sawicka Well done! President, Federation of Poles in Great Britain With regards to your letter, I must add my congratulations to you on your success in being published in The Times, but in particular, on identifying and underlining a major crime against the Polish Nation. I am just wondering if it might be worthwhile to involve the various Polish bodies that I am involved in to further publicise this. This may be possible to involve something like the American Congress of Poles in this activity. 96 Robert Szafaryn I'm no historian but would expect nothing less from Russia. They have always a deep-rooted dislike for the existence of Poland because Poland became "civilised" sooner than Russia. Surprised that The Times published it as I'm sure there are plenty of looted items in the British Museums and Art Galleries. 97 Henio Szyszko It's a very good letter, I remember reading it at the time you first sent it out....It's really good that these things are remembered and brought back to the public attention. One other thing I was very impressed with was the candles at North Sheen Cemetery labeled Polish Heritage Society on all Polish graves. 98 Elizabeth Ward Very Impressive!!! 99 Stanislaw Wawrzynowicz I'm familiar with the mainstream Tsarist, Bolshevik, Soviet and Russian atrocities against Poland ; but your letter covered unfamiliar territory, so thank you for enlightening me and bravo for successfully broadcasting to (and educating) countless thousands of Times readers - as well as a far wider audience! Brilliant! 100 Wisia Wedzicha Yes of course I saw your letter and omitted to congratulate you. Very good and sensible letter. 101 Leszek Werenowski Thanks for your email. I obviously know these issues and have since my dad told me about them as a boy. It is theft and people need to be reminded of that. Your letter does that - it keeps the issue alive. 102 Nicola Werenowska I was very moved by your Times letter - at last someone is opening people's eyes to the extent of the cultural theft and damage Warsaw/ Poland has endured. (Arizona, USA) What an excellent letter! I had no idea but I am not even remotely surprised. Has anyone from the paper asked to do an article on the topic? 104 Chris Harris-Woloniecki Very Good letter Marek and a point well made. (Bermuda) Very Good!! I have had time to read your excellent letter before going to court…. 106 Andrzej Zakrzewski Well Done! I assumed that Russia had pillaged Poland many times but no idea exactly what. 107 Tomek Zaleski The most shocking aspect of your crisp, efficiently informative, apposite letter is not by the devastating extent of this wholesale looting, nor yet the implaccable indifference of successive regimes to deny restitution, but how many of us knew so little of it. Thank you for this work, Marek. 108 Krysia Zielinska Just read the letter. I didn't know. The same would apply to my grandmother's huge stately home in Rowne! Well done. 109 Magdalena Zoltowska An excellent letter that has highlighted the extensive theft of art, books, etc from Poland by Russia - not only during WW2 (when, in addition, numerous works of art were deliberately destroyed) - but whenever Russia took it upon herself to invade us in the past. It is not often that attention is drawn to Poland's losses and hopefully pressure will continue to be put on the Russians to eventually relinquish at least some of its plundered loot. I visited the Hermitage, etc in late August. Apparently what is displayed accounts for about 10% of what lies in its vaults!